large pressure of water, 100% water proof. 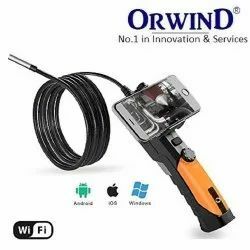 ORWIND BOROCAM Video Borescope /Wireless Inspection Camera & Display.Smart Features:-It is a Orwind Video Borescope Inspection Camera with 9 mmcamera diameter and 3.6 inch color TFT LCD Monitor(Optional).Ideal for Home Inspection (Inspect in walls for mold, insectinfestation, electrical wire or water pipe location); HVAC (Inspect inside ducts, behind motors and compressors);Automotive (View inside or around engines and transmissions);Industrial (Inspect weld integrity, process equipment, gears,molding machines); Aerospace (Aircraft inspections forcontamination, debris, cracks or other damage), andGovernment (Safety and security inspections) applications.Glare-free close-up field of view. Detachable wireless colordisplay can be viewed from a remote location up to 32 feet frommeasurement point. 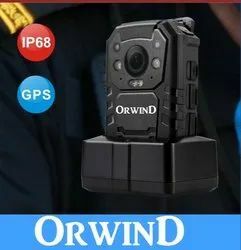 Complete with 4 x AA batteries, micro SDmemory card with SD adapter, USB cable, extension tools(mirror, hook, magnet), video cable, AC Adapter (100-240V,50/60Hz), magnetic base stand, and hard case. 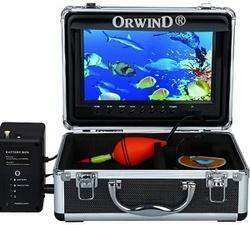 Looking for Borehole Inspection Camera Waterproof Video ?